Develop a CNC machine to meet the complex needs of the Italian jewelry and diamond cutting industry, including visual inspection and quality checks. Partner with FANUC to create a new diamond-cutting machine capable of working on and engraving balls, beads and even holes. A machine that has not only increased productivity and improved the quality of the finished product, but which runs non-stop to make the most of fluctuating gold prices. Jewellery-making is an important part of the Made in Italy industry that can capture the attention of foreign buyers and bring prestige to centuries of craftsmanship and tradition in this field (processing of gold and precious stones). The design and technology both make the creations of the Italian jewelry-making industry special. However, the machines designed and built in Italy, more specifically in Arcugano, in the heart of the jewelry district of Vicenza, enrich the jewelry-making labs across the world. Amongst the leading protagonists of this adventure, there is Faimond S.r.l., a company owned by the Dal Lago family and with over 30 years of experience in the field of precision engineering and automation. Faimond is specialized in the manufacturing of machines and equipment to work on precious and non-precious objects. Such devices are used in the jewelry industry, but also to produce fashion accessories and parts of eyeglasses. Diamond working is one of the last steps of the jewelry-making business and also one of the most important since it captures the glaze of those who look at a jewel for the very first time thanks to the processed pieces ability to reflect light; the engraving on the surface of the components (typically balls, beads or chains, therefore finished objects, rather than raw materials. "We work precious materials such as gold and silver", says Andrea Dal Lago, Head of the Administration & Sales Departments at Faimond, "but also less noble metals such as brass". The peculiarity of the process known as “diamond working” is truly the incredible brilliance it confers to objects: "A chain could simply be brushed or sifted, but the finishing and facets created by the diamond are able to give it unique mirror-like brilliance that is currently much appreciated, especially in the Arab countries and in India". Faimond was founded in 1976 thanks to the entrepreneurial vision of Gianluigi Dal Lago. "In those years, the market needed this type of processing", explains the company's founder. "The facets, however, were all made by hand, with a handpiece and a chisel. The processing times were obviously very long. At a certain point, the need for processing pieces that would be difficult to do by hand grew and, thus, the use of machines was introduced. Industrialization also contributed to increase, in an exponential manner, the production volumes: if by hand we were able to work 100-200g of materials a day, the introduction of tools allowed us to achieve up to 1,000 kg a day". Thus, Faimond was able to convert this new market need into a business opportunity. "At the end of the 70s, there was a real industrial revolution in the jewelry-making business. For example, it was the first time we were able to make a chain with a star engraved on it, whereas before we only saw shiny chains. Today, in Italy, few companies do this type of processing, but we must keep in mind that this sector is a small niche". As all the activities related to the fashion world, jewelry-making is subjected to the influence of trends and collections and it must therefore invest in innovation, which is an important and indispensable factor. "We make machines that can be operated after one or two years of planning and that are already outdated 8-12 months later. This is due to the fact that design is in constant evolution and not because technology has become obsolete. The designs can be changed, but the diamond cutting machines are often custom made so that they can perfectly adapt themselves to the processing of particular components", underlines Andrea Dal Lago. Without forgetting the crisis that affected the jewelry business in recent years: "Nowadays, 95% of our product is exported abroad: China, India, Indonesia, Russia, the Arab countries... all potentially big markets, but also very difficult to approach. We must also defend ourselves from those who copy everything we make, such as Turkey, Korea and China. For us, it is very important to have advanced technologies because even if the emerging countries can compete with us on prices, they currently are able to achieve the cutting-edge solutions we provide. Our superiority is the result of our inventiveness, skills and creativity and those who copy us need an entire team of people to assemble a product similar to the one designed by one of our engineers. It is a very demanding challenge and we plan on winning it. Through our quality." FANUC has become very important to us". The first collaboration between Faimond and FANUC led to the implementation of a special FT-Series machine, a transfer with 4 multiple heads custom built and highly productive. A partnership based on the common desire to win the challenges: in a few months, the project became reality and the machine started operating smoothly and without any issues. After this, a work area was developed for the molding and quality check of the pieces (the objects are loaded by the anthropomorphic robot, coined and measured, as well as they are61 selected or discarded via a visual inspection). All with the FANUC Brand. As already mentioned, the ultimate solution resulting from this partnership is called Astra, a diamond cutting machine characterized by its ability to work on balls, beads and even holes. "This machine responds to the need of continuous processing: there are no hourly cycles, but rather weekly cycles, if not monthly ones. There should be no issues with turning it off or on or during unattended processing cycles; downtime is not allowed because losing a day of work means being at the mercy of the fluctuating prices of gold. We needed the best and therefore chose a numerical FANUC controller." The CNC FANUC also helped us improve the quality of the finished product and the productivity of the machine by allowing us to save up to half a second per processed component on a cycle time of 6 sec. ; the dimensions of the piece are set around 4-6 mm. Faimond has converted all the software language of its machines to adapt it to the CNC series 0i-MD of FANUC. "For us, the challenge was to take the implemented project to another level and to replicate it on FANUC's numerical controller". The cooperation between FANUC's and Faimond's engineers help us improve the performance of the machine thanks to the electronic performance of CNC FANUC. 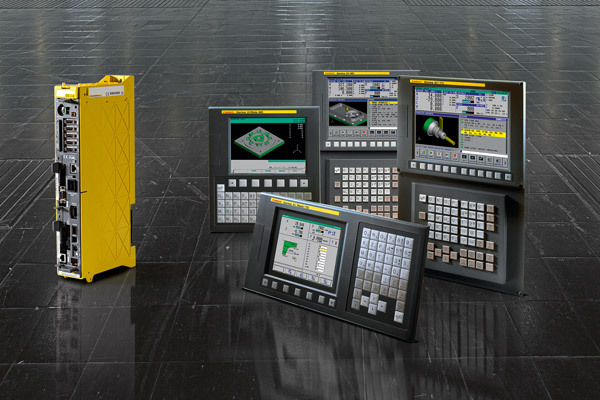 Astra is able to manage up to 7 axes, 4 simultaneously, and 2 tools automatically, as well as it is able to process vertically and horizontally. Since the difference for this type of micromachining especially lies in the precision, the axis must be strong from a mechanical viewpoint (therefore with no vibrations) and it must be controlled in a correct manner. The CNC FANUC was used at 100% of its possibilities and, for future developments (Faimond is planning to make a machine with 11 axes), better CNC FANUCs will be used. 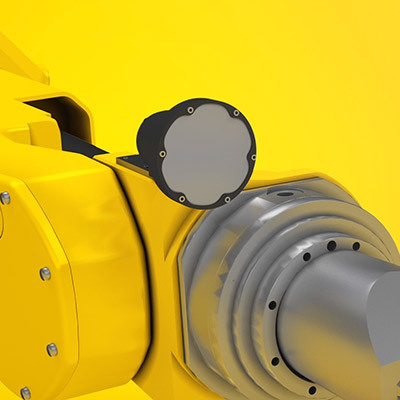 The major advantage resulting from the collaboration with FANUC is also the possibility to interface with a unique supplier for numerical controller, motor activation and robot: the procedures are simplified and every country of the Faimond world knows it can count on a FANUC reference for assistance. Last, but not least, another important aspect concerns the recovery of gold scraps with a percentage that reaches 99%. However, what truly makes the collaboration between Faimond and FANUC special is the reciprocal stimulus to face increasingly more ambitious challenges: from a technical viewpoint, of course, but also from a commercial one. Dal Lago concludes by saying "we must find a way to achieve a product that can be exported worldwide, even for countries where we cannot sell certain types of technologies for military safety or embargo issues".